There is no feel-good story here nor any contented bourgeois. 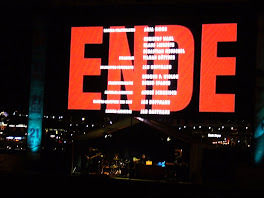 A workers' rally last November. Andy Pandy and Teddy at the shopping centre. Andy and co live in a picnic basket and are a BBC creation, a nice change from Shrek or Disney. The red theme is topical because today is Red Nose Day and the local school etc is selling merchandise with profits for medical research into SIDS. So, the mid-winter school holdays begin now. Next, the school has the Basic Skills Test in literacy and numeracy in connection with a National Benchmark regulation. It is so taken for granted that schools are the best place for primary school children. I have trouble believing in schools in their current form. The tyranny of education is upon us. Could most of it be left until adolescent years? Andy Irons, Hawaii Surfing Champion, is pictured at the shopping centre looking at Andy Pandy. Billabong sports clothing, a global company has HQ in Queensland. Billabong is a waterhole. 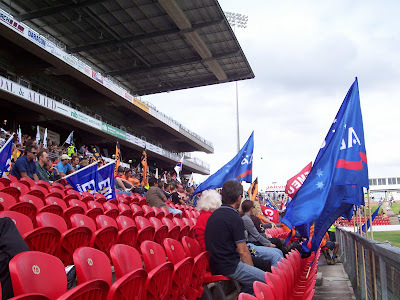 The grandstand is facing the wrong way. The crowd is watching but the main action is from the board riding surfers while the tugs are tugging the bulk cargo Pasha Bulker from off the beach. The ship has loosened and the bow has moved 6 to 8 degrees seaward overnight. I guess the art is in holding it there till evening despite the pounding waves but the line to the main tug seems to have failed. Was it the mainstay? Further attempts at salvage will be carried out with the evening king tides. It is an old tradition to watch dramas played out at sea. 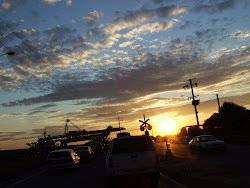 Port (Macquarie), Woopi (as it is known), Coffs (Harbour), Nambucca Heads, Byron (Bay) to name a few, then, next, the so so, mad Gold Coast and then Brissie. Part of the journey will be by "Rail Coach" - a bus! We are told this country has a skills shortage. While I don't know many of the visa requirements, employment is available for temporary residents. As well, unskilled work on short term work contract is offered. Young tourists have opportunities and I believe their work visas have been extended. Teachers and Nurses are sought after - as everywhere. Our young professionals are recruited for the UK etc, perhaps this adds to an imbalance. Todays the day. This evening the tugs will be part of the salvage of Pasha Bulker at high tide, 7pm. Surfer/Boardriders were not far away yesterday but an exclusion zone begins today on land and sea. The media will be there eg ABC.net.au/newcastle. Water temp is a cool 16.5C. Coal ships waiting off shore number 83 ships. It is just as well I didn't have a Digital camera at the time of the earthquake in 1989. It was reported that the hospital was evacuated and I set out to help and I cycled around much of the city within an hour or two and saw that event first hand. Possibly, the floods of three weeks ago did more widespread damage than the quake. It is hoped to move this stranded cargo ship on high tide possibly Thursday. Tides are reaching their maxium height soon. It is believed that the attached ropes are for towing out by tugs and there are two anchor points against which it will winch itself out. Gear for the containment of oil is assembled near the stone monument - Macquarie's Pier. As it is, the oil /fuel on the ship has been pumped into its higher tanks. They say it is too risky to use hoses and pump it ashore. The ship has buckled in the centre. Quite a task is ahead. The signs say keep left. Old Man Lincoln, in his usual wonderful style, recently showed us some little sparrows. In this photo can be found local sparrows awaiting crumbs from the picnic tables. The stranded cargo ship was but one attraction. Love was in the air. Shipwreck T Shirts, $29, with Australianisms. But Captain you said left before Nobbys lighthouse. You stupid I said left turn after the lighthouse. Refer to 22 June etc. The world's greatest posting - NOT. Scene on luggage carousel. Unclaimed baggage? Triumph or not? The world's greatest racer? Another triumph for Casey Stoner in the British Grand Prix at Donington Park in MotoGP, putting him well ahead overall. Casey Stoner is from this area, from Kurri Kurri - no less. (The Herald, Newcastle) The bike is wired directly to the central nervous system. As the banter goes. Solar cells and free electricity for a sunny future! Ute owners frequently keep a dog on the back of the ute. Not just any dog, this one is a brown Kelpie. Is it a sign we are keeping well up with the times? Is it the end of religion? The French philosophers are very savvy that way. This church at Merewether Beach is closing up this weekend and the community will go to neighbouring churches instead. All the local traditions will come to an end. It is where I was married and there were other family occasions. Well, it's only bricks and mortar and the style of the building is nothing special. The writing has been on the wall for some time now and nothing has been done about these changes. There is no pressing need to close these churches except that communities are incapable of taking the initiative and of maintaining their own heritage. At first, services were held in a hall before the church was built in about the 1960s and the people 'grew' this new building. I believe the clergyman, at that time, was a great rugby supporter hence the Merewether Carlton Rugby Club - now arguable the largest and most successful in Newcastle. Later on, the old hall was demolished and a trendy school emerged as well as other 'nice' buildings. Here today gone tomorrow. I suppose the church property will be 'developed' now. Update. The actual closure is on 30 June, my mistake. 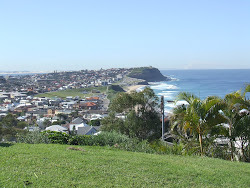 Nobbys Headland was logged by Captain James Cook in 1770 when it was twice its present height. It was an island separated from the mainland by a narrow channel and between 1820 and 1858 it was cut back to the current shape and a lighthouse was lit there. To enter the harbour was a perious undertaking. In the early 1800s a breakwater connecting the island was commenced using the rock cut from the top of the island. 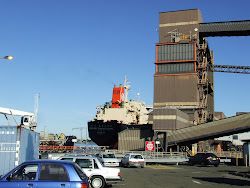 As time went on further breakwaters were built using stone from Braye Hill Quarry, Waratah, as well as off loaded ballast. Numerous ships sunk in the early days frequently to the north off Stockton. The Oyster bank on the north side of the entrance to the harbour claimed a succession of ships. A lifeboat and tugs became essential and took some getting. Coal and rich cedar timber were exported. The coaster Maianbar, in tow for Sydney broke away and went aground on this same beach in 1940 right near the seawall above and became a total wreck. Many heroic stories about dangerous and stormy conditions are recorded. The Susan Gilmore sailed the Pacific and the American Captain Carver brought his wife and young son along in 1884. From Sydney to Newcastle they were towed by a tug to save time. A gale set in and the towline parted and the Susan Gilmore could not beat out to sea, helpless, all she could do was signal for assistance. Another steamer attempted a tow without success and the anchors failed to hold and in darkness the Susan Gilmore was driven ashore near Bar Beach. Seven of the crew got ashore but the small boat filled with water with Mrs Carver in it and her husband managed to get her back to the ship. Some put a lot of store in education. Pictured is a centre for Aboriginal Studies. In 1980, Jack Doherty founded the Newcastle Aboriginal Support Group to overcome divisions and seek full acceptance and equity for Kooris and undergraduate scholarships for Koorie students were commenced. The inclusion of indigenous studies into mainstream courses is a hughly positive move. Saint Andrews Presbyterian Church, Laman Street and beyond to the Conservatorium Hall, taken early May. We are close to mid winter and close to the shortest day and the winter Solstice with morning light about 7 am and darkness around 5pm and today is really wintery by our standards. 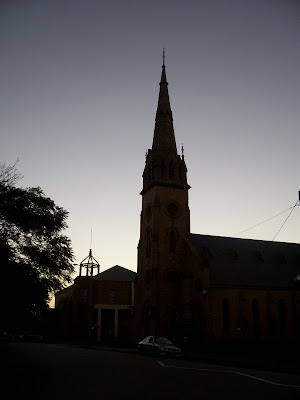 The church spire has a tiny resemblance to one in Vienna shown in the introduction to the series, Kommissar Rex, on SBS TV. This canine detective would be known world wide. Machinery for the Mining Industry. All that might and grunt yet a boring topic, not only that, I was asked to move on, camera unwelcome, on ( an almost) public road. It's named The Beacon. With sombre skies. Its nautical theme captures the essence of travel and discovery (according to its sign) whilst the masthead, sprocket and sail embody the history and nautical achievements of Newcastle industry. Dedicated Sep 3 1999, commissioned by the Honeysuckle Dev Corp and created by Geoffrey Bartlet. In Hannell Street, with Carrington Bridge in the distance. Whipped cream and strawberries - that takes the cake! A freezer was defrosted. It stores bags of party ice. A pallett with bags of ice had been delivered and the men were sorting it out. 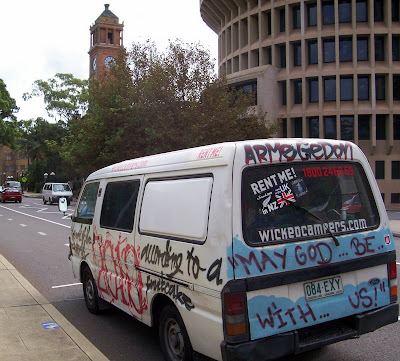 Wicked Campers, each with a unique prophetic design. Wicked camper V.
A severe storm several days ago destroyed the amenities, animal houses and the bird cages at Blackbutt Reserve. This park of natural timber, walking tracks and animal enclosures and picnic areas is very a popular retreat. 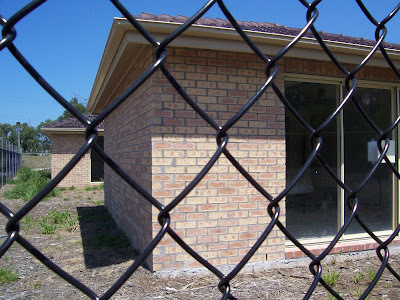 Prior to this the council considered closing down the animal enclosures due to budget cuts. What does the future hold? Royal Enfield of India, formerly British, the oldest motorcycle company spanning three centuries. This British engineering company build a lightweight bike suitable for parachuting in during the war. Later the Indian Government made a large purchase and assembled and made parts and eventually took over manufacture in Chennai under licence when the company closed in Reddich. An Australian company organizes motorcyle tours and the Royal Enfield seems to be the choice for the Himalaya tour. Enfield was also a small arms factory hence "build like a gun goes like a bullet"
Similar vintage? 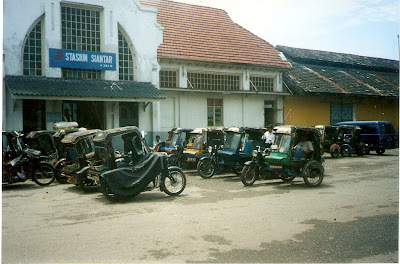 An amazing collection of BSA's at rail Stasiun Siantar, Sumatra, a few years ago. This could have been worse. There is minor damage to the residence following a gale. Perhaps some trees have shallow root systems while others are stronger. A real man with a chain saw and lots of safety gear. Did they tempt fate with this sales gimmick? Was it bad karma? A crocodile chasing a car sales man! A flash flood occured and probably ruined all these vehicles in a car sales yard. 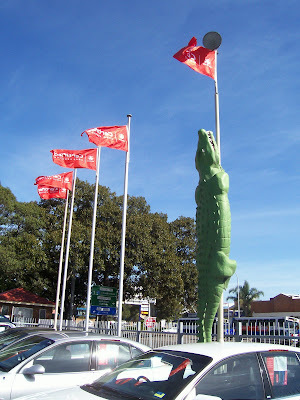 Car Yards use advertising so as to sell more cars and this car yard has a crocodile running up a post. At first there was a man at the top of the post but he has fallen down. Tempat penjualan mobil menggunakan reklami untuk membantu menjual lebih banyak mobil. Mereka membuat gambaran buaya yang berusaha naik keatas tiang yang dahulunya diatasnya ada seorang laki-laki tetapi sekarang sudah jatuh. Newcastle Jockey Club. Echoes of 'a day at the races'. I'd take a punt yesterday's race meeting was cancelled due to local difficulties. 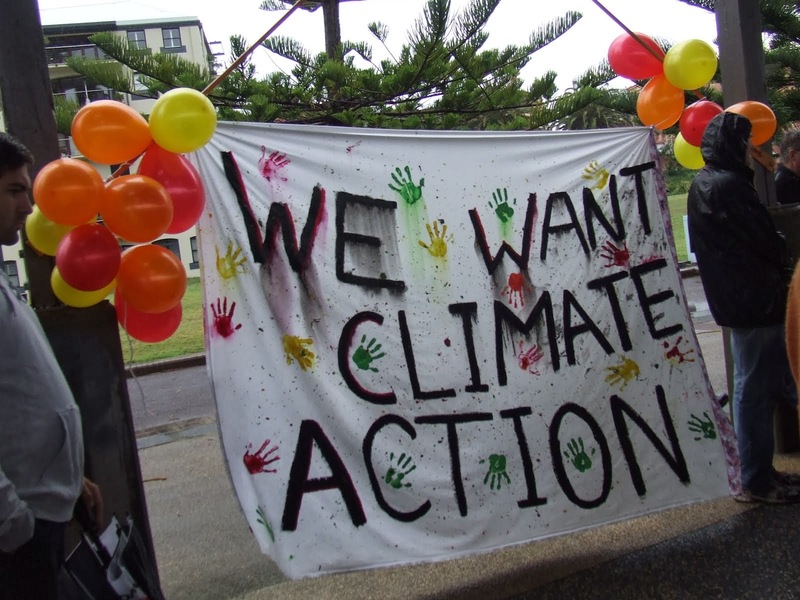 The local ABC radio which streams on the WWW, has faithfully hosted a point of contact service and information so as to assist everyone at this time and their efforts are appreciated. 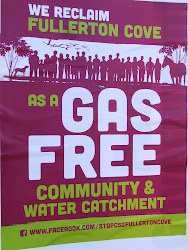 It was the same when the bushfires raged. In the aftermath of THE earthquake there were no similar communications. I had wondered if this would be exploited, gung ho, with the tearing down of buildings willy nilly and some of that did take place. Nevertheless, some informal networks were mobilized. Really, there is no risk of organic mass demonstrations taking place here. Howcome the Europeans appear to do this so well? Vocab: gung ho intemperately and naively enthusiastic. willy nilly in random order; in disarray or shilly-shallying! Stuck hard and fast on Nobbys Beach four hours ago. Gales and heavy surf have probably run the Pasha Bulkers aground. The crew were ferried by choppers to the nearby park- dangerous work. out to sea when storms threaten. Soon after, a torrential rain storm hit and in no time water overflowed the gutters flooding many parts of town for a time, adding to the chaos. What a difference a day makes. 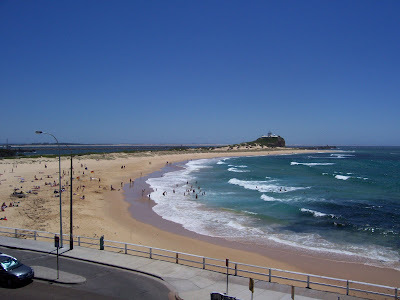 The same beach is very popular for surfing and board riding. If a stranded ship breaks up it will be a different matter. It will have a risk assessment soon. The weather has been extreme with gales and a hugh sea swell and visibility is poor. A second ship is in difficulties off Stockton Beach. Tugs are at work there and the ship has two anchcor lines tangled up to add to the problems. Torrential rain is creating floods in much of the valley and in our streets. Trees everywhere are shedding branches or being uprooted. Blackouts are widespread as the power lines etc are blown down and the traffic is having all sorts of difficulties. Taking the inventory before the expedition. Have we got everything? One traveller from Sweden, one from Ireland and another from Texas. Round Australia is in their sights. They planned to get a new bull bar ( as we say) on the front of the van. I mentioned how it may not be a good idea to drive at dusk and early evening when the kangaroos are out and about - in country areas. Or sometimes it's cattle on the road. 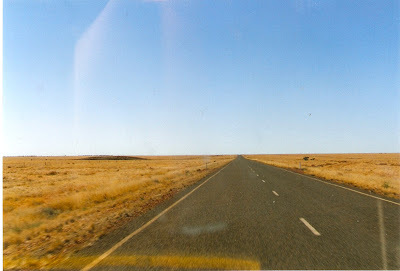 Central Queensland, a gun barrel highway? How much heating and cooling does your home require? Good design comes into this as well as useful information about building materials and home construction. These small model houses have detailed monitoring done 24/7 and are wired up so as to measure certain variables such as the environmental effects and the insulative properties. It is only fairly recently that energy efficient housing has become mainstream. The positioning of the house and windows, insulation and wide shady eves are among some of the factors that go with energy efficiency .